The Dupplin Cross is located in the Parish Church of St Serfs in the Villlage of Dunning, Pertshire. It is a symbol of power and prestige of the Pictish Royal Family. It once stood on a hillside overlooking the Palace at Forteviot, several miles from Dunning. The carvings celebrate King Constantine, MacFergus during whose reign the Picts and the Scots came together. 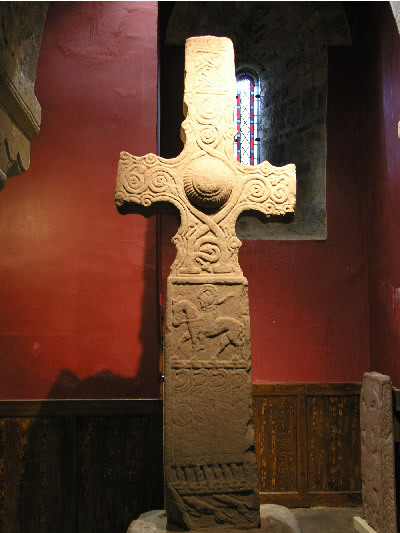 The Dupplin Cross carved in the region of 800 ad was carved to honour Constantine, son of Fergus whose name is inscribed on the back of the cross. Constantine was Kind of the Picts around 789 ad for about 40 years. In the latter part of his reign he also ruled over the Scots in Argyll. This 3 metre high sandstone cross is the only complete example to survive from that period.